Playing with kale is a lot a fun. It’s a green veggie that can be prepared many ways. This salad goes as a great side dish to any meal. Start by steaming kale lightly for about 5 minutes or until stem starts to soften. While steaming place juice of both lime and lemon in a large bowl with honey. Add salt, pepper and whisk together. Then, add nuts, raisins and toss well. 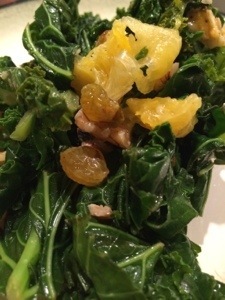 When kale is done, while hot, toss it into bowl with the nuts and dressing. Toss everything together well and allow it to sit for a few minutes. Serve warm.